2. Create a board of everything that inspires you about this holiday and name it "Perfect Valentine's Day Outfit from FashionJunkee.com". Be creative! 4. Use the hashtag #fashionjunkeevalentinesday on everything you pin on this board. 5. Add a comment below and include a link to your board. Must follow all rules (#1-5) to enter the contest. Contest ends 2/14/13. Winner will be chosen and announced here (on our blog) on 2/18/13. 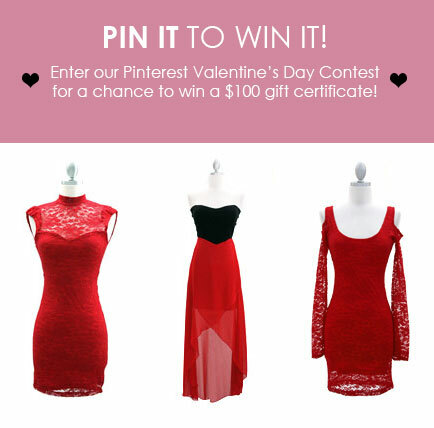 The winner will receive a $100 gift certificate to FASHIONJUNKEE.COM. Good luck and happy pinning! I love this place, it is so amazing!